A veterinarian visit is a must for an itchy shar-pei. Anyone who loves a Chinese shar-pei knows that itchy skin often comes with the territory. Because many health issues can result in itchy shar-pei skin, proper diagnosis and treatment are vital for this unique canine's well-being and comfort. Fleas are a leading cause of itching in the shar-pei. if you notice that your pet is scratching and chewing, especially around the head and hindquarters, it's likely he has fleas. The most common parasite in dogs, these nuisance insects reproduce quickly and cause severe itching when they crawl on the host's skin. The bites of fleas can also cause an allergic reaction and dermatitis. When diagnosing parasites, a veterinarian can easily see flea infestation and offer a variety of medications that will kill current fleas and prevent future fleas from making the pet their home. The shar-pei is a breed that is particularly prone to allergic reactions to a wide range of environmental and internal factors. Food, insects, grass, weeds, trees, cleaning chemicals and other animals are some of the more common triggers that make a shar-pei itch. Fur loss and secondary ear infections often also go along with itchy skin caused by allergies. A veterinarian can give a shar-pei skin and blood tests to find out what he is allergic to. The results will indicate exactly what is causing the problem, and enable the owner to limit exposure. Injectable allergy serums are often prescribed to reduce the dog's sensitivity over time, in addition to a special diet if the test indicates a food sensitivity. 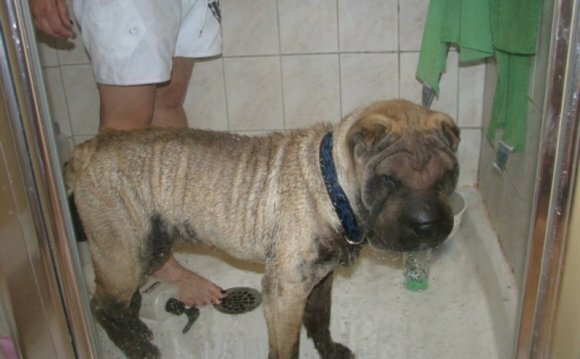 Demodectic mange is another condition frequently found on shar-pei skin. Caused by a mite, this form of mange is often transmitted from a mother dog to her pups. It can cause severe itching, fur loss and even death if a severe secondary infection occurs. Sarcoptic mange, caused by a different mite, is more contagious but not as serious as demodectic mange. However, forms of mange are very uncomfortable for the infected dog and cause a bacterial skin infection called pyoderma. Though any dog can contract mange, the shar-pei's folds and wrinkles make him a prime candidate for inflammation and infection caused by the scratching that goes along with having these nasty mites. Both types of mange are diagnosed by analysis of a skin scraping under a microscope. Upon diagnosis, a combination of topical and oral medications is prescribed. The shar-pei breed is prone to hypothyroidism, reduced activity of the thyroid gland. The disease often causes a host of symptoms that include thin coat, lethargy and itchy skin. Though the symptoms of hypothyroidism are similar to those of other conditions that cause excessive scratching, the disease can be diagnosed with a series of blood tests that included a complete thyroid panel. When the disease is discovered, medications prescribed by a veterinarian can help to get thyroid activity back to levels that will relieve the shar-pei's itchy skin (and may make her more comfortable in other ways as well).